Washington, D.C., 1935. "Streamline streetcar, Capital Transit Co." The last word in modern mass transit. Harris & Ewing Collection glass negative. View full size. Submitted by rookzie on Sat, 01/17/2015 - 8:07pm. The reason that DC streetcars appeared to run as “magic carpets” without the use of overhead wires is that they would use underground conduit current collection instead, with their poles retracted (lowered). Streetcar “conduit-powered” track consisted of 1) two steel wheel (running) rails (a type called "girder rails", readily identified with integral grooved inboard wheel-flangeway, and a special hot-rolled cross-section to minimize flexing and damaging of adjoining pavement); and 2) a pair of center slot rails which formed a track center slot, all mounted on 3) sub-surface cast-iron yokes, transversely buried below street level every few feet. Capital Traction (later DC Transit) had its streetcars as “hybrids” that could utilize either overhead trolley lines or below-surface conduit power, as required by DC’s ordinances within the local “federal district” (a large but rather jaggedly bound region of the central city). All lines had been equipped to operate in either power mode along its route: e.g. the Nº 70 Georgia Ave/7th St. Line, where the cars would run in street plough pick-up mode, from the wharves in SW DC (Maine Ave), along 7th St. to a point just north of U-Street/Florida Ave. NW (where 7th becomes Georgia Ave.). A signal light on a pole at street side indicated to the operator the stopping point for the changeover. 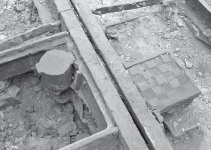 Power would be turned off, and a “pit-man” would be charged with handling the street conduit changeover at a utility facility referred to as a “plough pit”, a rectangular cavity in the street and next to the track, where the pitman would open the square-shaped manhole cover and enter this pit, unplug the electric leads and detach the plough (plow) from beneath the car, and stow the plough away from the car (for re-deployment to another streetcar). The pitman finally would close the pit and extend the trolley pole (using the retractable rope and pole reel on the rear). Then the power would be restored. Submitted by Divebus on Sun, 08/31/2014 - 1:41am. The Arlington Trust Co was on N. Moore St. and Lee Hwy. There was a circle on the Rosslyn end of Key Bridge and this is it. Submitted by sash on Sat, 06/14/2014 - 10:29pm. It did have center rail or whatever its called (I'm no streetcar expert). DC didn't have overhead wires, by law. If you trace a line straight down from the S in "LOANS" you can see the center rail. Submitted by Tango02 on Mon, 06/09/2014 - 2:14pm. The Czechs have copied this style (More specifically, the design of the PCC car) as "Tatra T1". The descendants of this type (T2, T3) go today anywhere across Eastern Europe. In this sense that is the ancestor of the Tatra T3. Submitted by Mark Newton on Mon, 06/09/2014 - 4:52am. Another San Francisco Muni PCC still running car is "Torpedo" No. 1014, preserved in Sydney, Australia by the Sydney Tramway Museum. It's shown here with another of our foreign cars, Nagasaki 1054. That's me on the left with my friend and fellow museum member Ben. Submitted by LorenzoB on Sun, 06/08/2014 - 9:51pm. The trolley is down; I see no centerline pick up between the rails. Submitted by StanFlouride on Sun, 06/08/2014 - 11:47am. 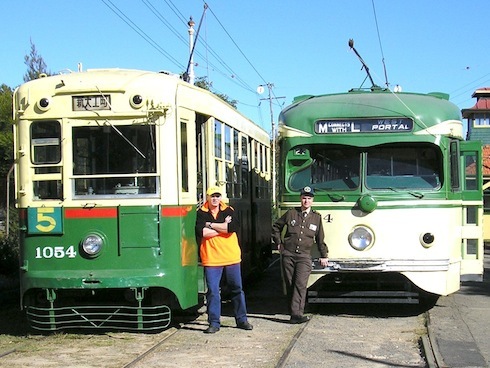 San Francisco has 32 PCC cars running as part of F Line fleet of historic trolleys. They're painted in the colors of the systems that used them originally. Everything from Toronto to Mexico City. 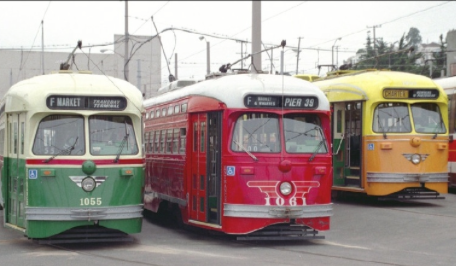 These 3 are wearing the liveries of Philadelphia (post-war), Los Angeles (Pacific Red Line), and the Los Angeles Railway. Submitted by John Newbold on Sun, 06/08/2014 - 7:28am. I remember cars similar to these in Philadelphia in the '50's. Sometimes there was also an attendant at the back door who could take fares. When the 'enter back' sign was used, the driver didn't wait for all the fares to be collected. He took off as soon as he could close the doors. Submitted by mailman7777777 on Sat, 06/07/2014 - 8:31pm. The bars are to keep stupid people's heads inside. Nothing like whacking your head on a pole or another trolley. Submitted by jimboylan on Sat, 06/07/2014 - 7:22pm. The bars (window guards) are to keep passengers' appendages and little siblings from being damaged because they stuck out too far. Submitted by Mark Newton on Sat, 06/07/2014 - 6:53pm. No. 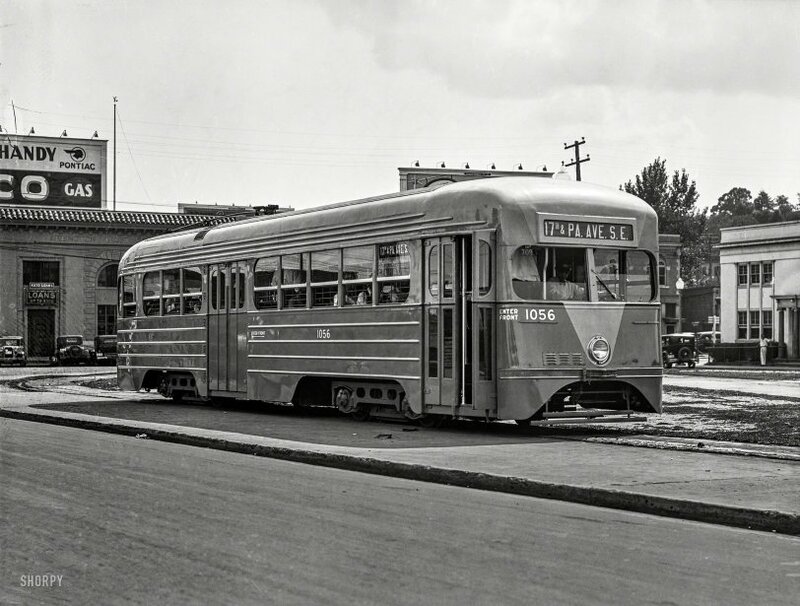 1056 is one of 10 streetcars built by St. Louis Car Co. for Capital Transit in 1935, along with 10 similar cars from Brill. They had numerous advanced features intended to improve speed, acceleration and passenger comfort. They were precursors of the PCC streetcar design which would enter service in 1936. One car from this group, No. 1053, was preserved at the National Capital Trolley Museum at Wheaton, Md. until it was destroyed by fire in 2003. Submitted by Steamcrane on Sat, 06/07/2014 - 4:15pm. This is one of a batch of 20 cars that were built during the time that the Presidents' Car Conference was developing the extremely successful PCC. It borrows many of the early PCC concepts, but ends up a bit awkward in comparison to the iconic PCC. There was one surviving example, 1053, which was lost in a fire at the National Capital Trolley Museum. A photo of the 1053 can be found here. Submitted by Ice gang on Sat, 06/07/2014 - 12:13pm. Why the bars on the windows -- to keep you in, or keep them out?